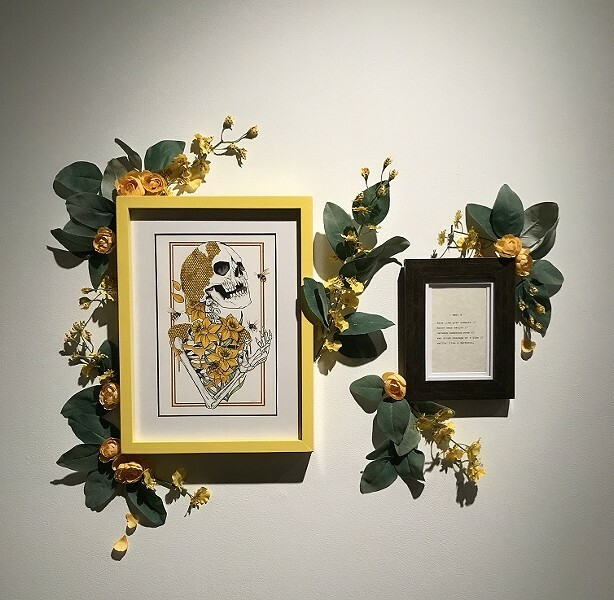 Leading up to Monday afternoon's Great American Eclipse, I visited Makers Gallery and Studio to see the current show, "Schemes," which consists of eight collaborative paintings and poems arranged in artful installations. I had been reading some articles about how the sky show would affect minute animal life on Earth, so my dome was already brimming with wonder at macro and micro levels. The poems written by J. Edward Moss and the responses painted by Virginia McDonald — in their combined celestial-terrestrial terms and imagery — brought to mind Annie Dillard's wonder-filled "Total Eclipse," her heart-rending, perfect response to witnessing the total solar eclipse in 1979. "We teach our children one thing only, as we were taught: to wake up," she wrote. "We teach our children to look alive there, to join by words and activities the life of human culture on the planet's crust. As adults we are almost all adept at waking up. We have so mastered the transition we have forgotten we ever learned it. Yet it is a transition we make a hundred times a day, as, like so many will-less dolphins, we plunge and surface, lapse and emerge. We live half our waking lives and all of our sleeping lives in some private, useless, and insensible waters we never mention or recall. Useless, I say. Valueless, I might add — until someone hauls their wealth up to the surface and into the wide-awake city, in a form that people can use." This usefulness drawn from private depths that Dillard describes — trawling the unfathomable realms of individual capacity and returning with pearls — is science and technology, but it's also art. It's also poetry. Moss approached McDonald a while ago about collaborating, says Makers curator Alex Gruttadaro. Color is the unifying theme, and Moss gave himself a set of parameters: each poem is defined by a different color scheme; each is five lines in length; and each line contains a shade of the scheme or an object that shares the color. After Moss created his poems, McDonald used them as inspiration and incorporated some element of the poem into each painting. This show was also a chance for McDonald, who is known for her illustration practice, to exhibit her painting skills, Gruttadaro says. It's her first time showing her work at this scale (she has been part of group shows in the past). It's a fascinating exercise between artists, and for the audience, to find which pieces of phrasing inspired what imagery. 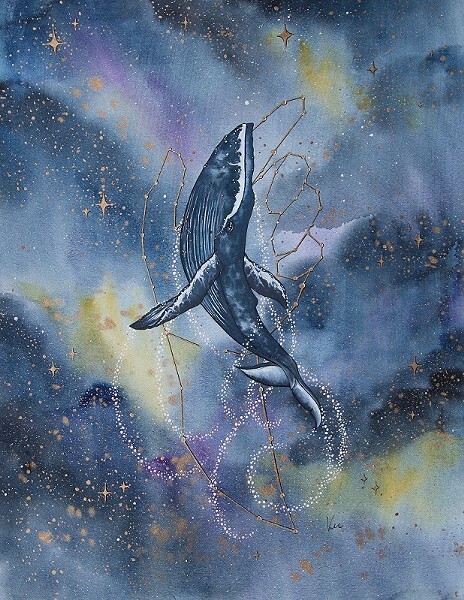 Moss's poem "blu" speaks of song and skies, the sea and sorrow; McDonald painted a blue whale soaring through the cosmos, trailed by a swirl of bubbles, and cradled subtly by a hand formed by the stars. Moss's enigmatic little "zlda" suggests old bones and new, green growth: "hope that colors ivory // brought from cities sown in emerald // stay determined like jade(d) dreams // swung round viridian's brain // catching luck by the clover." 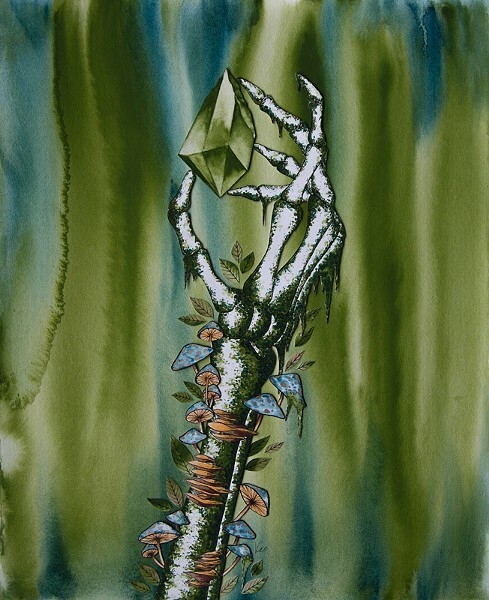 McDonald picked up on these subtle images, painting a moss-covered skeletal hand clutching a green gem. Tiny foliage and mushroom caps, each a tiny painting on cut paper adhered to the whole, trail up the not-so-lifeless limb. Art by Virginia McDonald created in response to J. Edward Moss's poem, "blu." McDonald's response to Moss's "sno"— with its wintery tone both punishing and full of promise — was to paint a small bird about to alight on a gently gesturing marble hand, surrounded by branches of frozen red berries. Her painting after "scrlt," features a femme fatale cradling a human heart to her ear, listening carefully as it pumps a crimson current down her arms and over her shoulders. With only eight small works and a lot of space to fill, "Virginia and I talked at length about creating some sort of installation atmosphere around each piece," Gruttadaro says. "Because we knew that there was going to be so much space between them for them to breathe, it would be way too much white walls." McDonald and Gruttadaro solved the problem by creating an installation aspect of floral and natural elements around each piece. Taking cues of hue and symbolism from each work, the installations include swaths of vibrant silk flowers or leaves, a whirlwind of black feathers, or a field of stars painted directly on the wall around the framed works. It has the effect of an engaging burst of life, drawing the viewer in for a closer look at the small words and worlds. A boxed set of prints, containing each of the poems and images, is available for purchase at Makers. Installation view of art by Virginia McDonald and poem by J. Edward Moss.